One of the things D.C. is known for is the influx of tourists this time of year hoping to see a bunch of pinkishly white trees along the river. 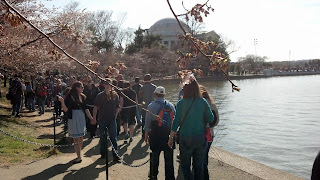 Last week, we tried to see them on a river cruise, but the cherry blossoms hadn't appeared yet...so we sailed for an hour looking at the District without foliage. Yay. So, in an effort to better gauge whether we should try to go downtown this weekend, I decided that I would run by there on my way to work. And I mean, literally, run. 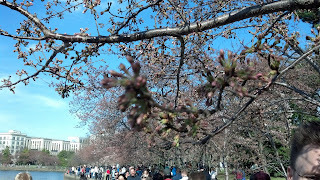 I took the metro in to the Smithsonian, stepping out on the Mall just after sunrise. 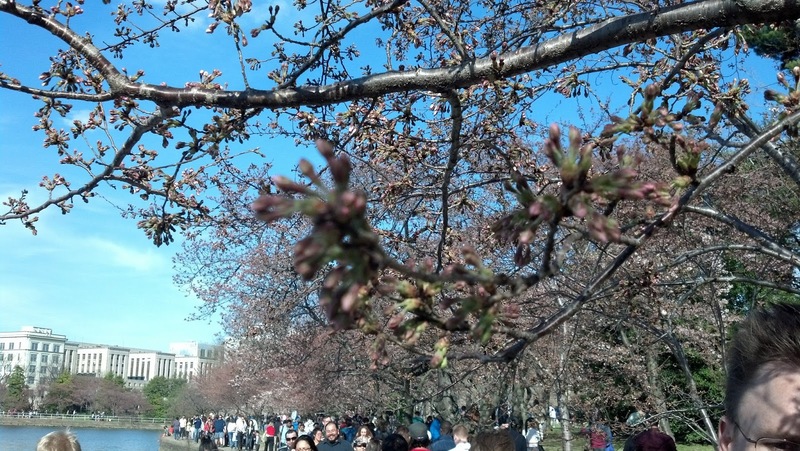 From there, I ran to the tidal basin, only to see a staggering display of no cherry blossoms. The fact that it was just above freezing probably had something to do with it. There were a couple of photographers with their fancy cameras on tripods trying to capture the early morning light on the Jefferson Monument, but let's face it, the trees weren't nearly as pretty as they could have been. I had planned on taking a picture to post here, but it seemed like a waste of time. Here's hoping that next week's run is better.